Back in the year 1998, the Wavescan DX Contest for that year was a search for the World’s Largest QSL Card and several hundred entries were received from all around the world. The largest QSL that was revealed at that time was actually a set of twelve cards that showed a complete panoramic photograph of Quito City when placed side by side. This series of twelve QSL cards was issued by the well known Gospel shortwave station HCJB in Quito Ecuador in 1996. As a compete panoramic picture, the total area of all twelve cards measures 260 square inches, 1.8 square feet. However, in more recent time, we have acquired an old QSL booklet from another radio station in South America. The front cover of this booklet contains the QSL text in both English and Spanish, and the entire booklet was sent out as a QSL in response to listener reception reports. The total booklet with its 16 pages, renders a total of 881¼ square inches, a total area of 6¼ square feet. That is more than three times larger than the previously known largest QSL set from HCJB. This fascinating QSL booklet was issued by a shortwave station in Caracas Venezuela. Apparently the station was well heard over quite a wide area, as the booklet is dated in May 1933, as the Second Edition. Interestingly, this radio station is the oldest radio broadcasting station in Venezuela, which will be celebrating its 87th anniversary this year. This is their story. It was on Tuesday December 9, 1930, that a new mediumwave station in Caracas Venezuela made a test broadcast in order to give coverage to a good will gesture from the United States. The event took place on the Plaza in front of the National Theatre in Caracas and it was the unveiling and dedication of a statue honoring Henry Clay, a prominent United States politician. There was another test broadcast on the next day; and on that occasion, the Naval Brass Band from the USS Northampton was playing at the La Guaira Country Club, which was located in the port city of La Guaira, 20 miles distant from Caracas. On the third day, now Thursday December 11, 1930, this new commercial radio broadcasting station was officially inaugurated in a series of special events at the Almacen Americano Building in the central downtown area of Caracas. The studios for this new radio broadcasting station were located on the second floor of the Almacen Building and the antenna masts were on the roof of the building. This new radio broadcasting station was granted the callsign YV1BC, with the two first letters YV indicating Venezuela, the number 1 indicating that it was the first radio broadcasting station in the entire country of Venezuela, and the BC standing for Broadcasting Company. The mediumwave transmitter was a 100 watt unit from RCA in the United States. This new radio broadcasting venture was so successful that plans were soon laid for increasing its major coverage area. 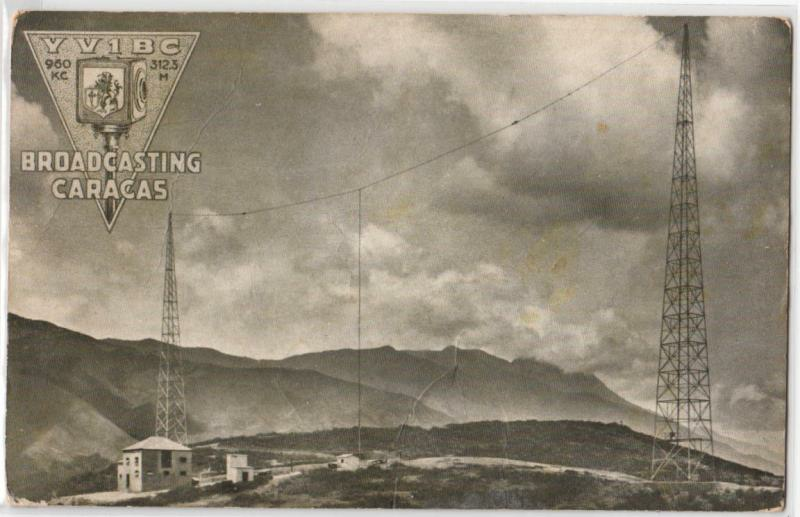 A new 5 kW RCA transmitter was imported and installed in a new transmitter building on top of a nearby mountain, 4½ air miles from the studios in central Caracas. The new transmitter site was at an altitude of 3930 feet above sea level; the two antenna towers were 490 feet apart, they stood at a height of 200 feet, they supported a T type center fed antenna, and the Caribbean Sea was visible, just 5½ miles distant. The power supply for this new mediumwave mountain top radiostation came from their own generator, and the operating frequency was 960 kHz in the standard mediumwave band. It is presumed that the shortwave counterpart of mediumwave YV1BC was also installed in the same mountain top transmitter building. The shortwave unit, presumably also of RCA manufacture, operated at 200 watts on 6112 kHz or 11695 kHz, according to scheduling requirements. Soon after the inauguration of the new radio station on the mountain top, a new callsign was adopted. The original station YV1BC was in reality not the first radio broadcasting station in Venezuela. There had been an earlier government station AYRE which was inaugurated four years earlier. However, due to the political events at the time, the station was closed after just two years of broadcast service. Around the time when the new mountaintop station was inaugurated, a new callsign was adopted, YV2RC, with the YV indicating Venezuela, the number 2 indicating in reality the second station in the country, and the letters RC indicating Radio Caracas, their new on air slogan. It seems that a new shortwave transmitter was installed in the mid 1930s, and 5800 kHz became their preferred shortwave channel. At that stage, another new callsign was allotted to the station, this time YV5RC. Then in the mid 1940s, a 7½ kW shortwave transmitter was installed under a similar callsign YV5RN. However, that was changed again some five years later to YV5KR. In 1951, the amateur style callsigns for both mediumwave and shortwave stations in Venuzela were abandoned and a standardized system of just four letters, beginning with the country prefix YV, was introduced. At that stage, the 10 kW mediumwave transmitter on 750 kHz became YVKS, and the 7½ kW shortwave transmitter on 4920 kHz became YVKR. Shortwave was dropped in the late 1970s, at the same time as mediumwave on 750 kHz was boosted to 100 kW. That was a Station Profile on the oldest continuously operating mediumwave broadcasting station in the South American country of Venezuela and they issued the world’s largest QSL back three quarters of a century ago.